Whilst some readers may find Glantz’s style a little dry, this is operational history at its best, meticulously researched and presented for the reader to analyse. 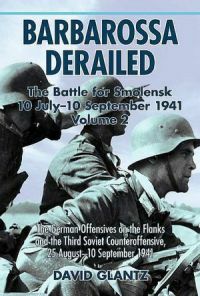 The extent to which Operation Barbarossa was in fact derailed by Soviet resistance around Smolensk is debatable; however Glantz’s study provides an excellent starting point for that debate. The complete set of books – a two volume narrative of the campaign, followed by a volume of translated orders and a volume of maps – will be a valuable addition to the bookshelf of anyone who has an interest in the Barbarossa campaign.